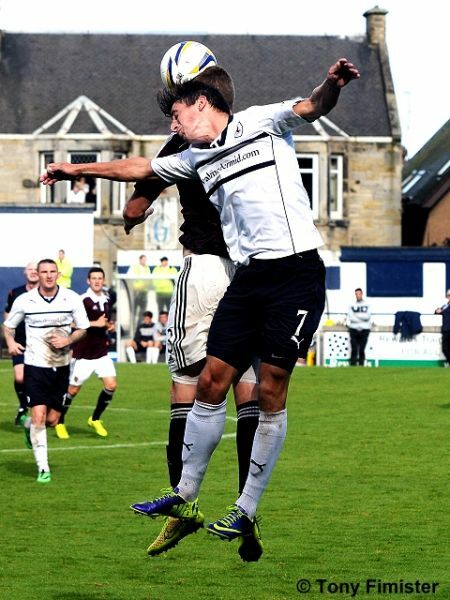 Raith Rovers relinquished their perfect start to the Championship league campaign when they were comprehensively beaten 4-0 by Hearts at Stark’s Park this afternoon. 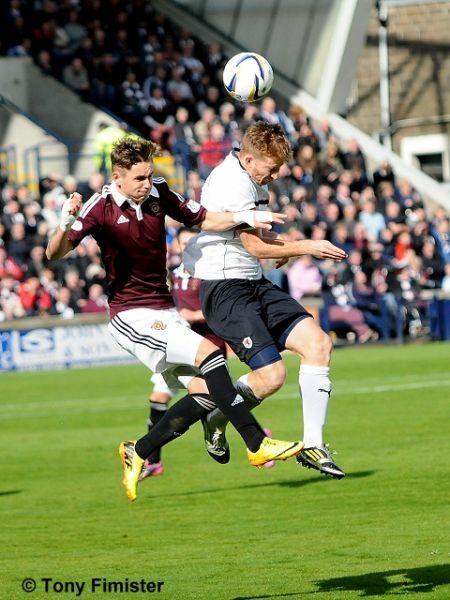 Robbie Neilson’s young side, having seen off the challenge of Rangers and Edinburgh rivals Hibernian in their opening fixtures, came into the match with confidence high, and, for all Rovers could also boast a perfect start with six points from their first two games, the final result didn’t ultimately flatter a Hearts side who dominated proceedings for the most part. The late summer sun shone brightly at kick-off, with a healthy and boisterous crowd anticipating a keenly contested clash between two form sides. The opening exchanges were frantic, with the ball skidding along a surface that appeared perfect despite earlier rain. 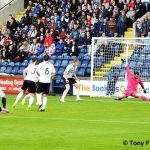 The visitors dominated possession much to the delight of their huge travelling support, and it was clear from their neat passing and movement that Rovers were in for a testing afternoon. 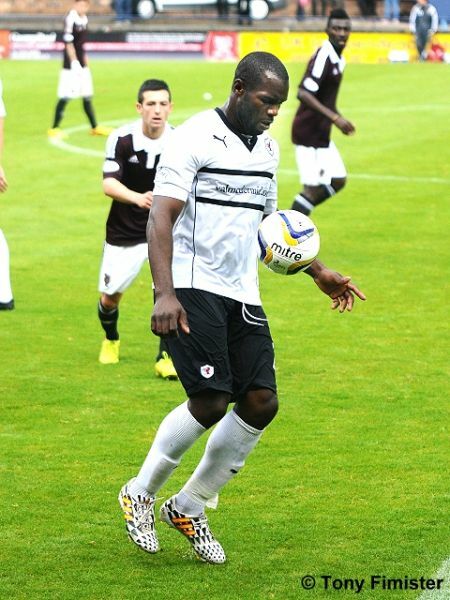 Within a few minutes, Grant Anderson required treatment for a head knock, although the same player recovered sufficiently to whip in a cross shortly afterwards which met the head of Christian Nade. 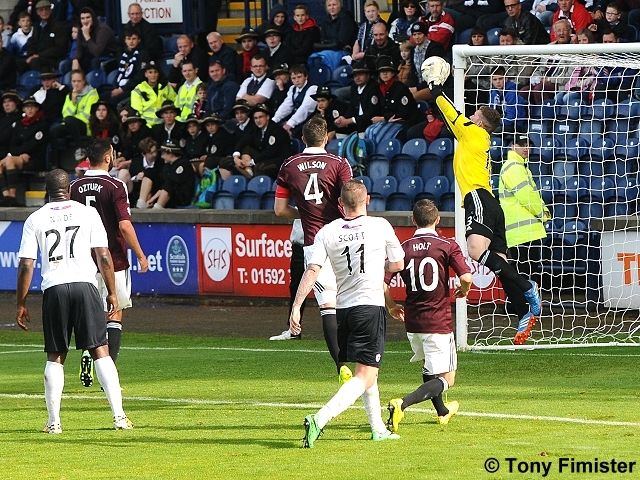 However, the big striker’s header sailed harmlessly into the arms of Hearts keeper Jack Hamilton. 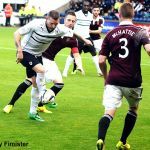 Hearts continued to look dangerous breaking forward, and with fifteen minutes on the clock, a well-worked move led to the opening goal. 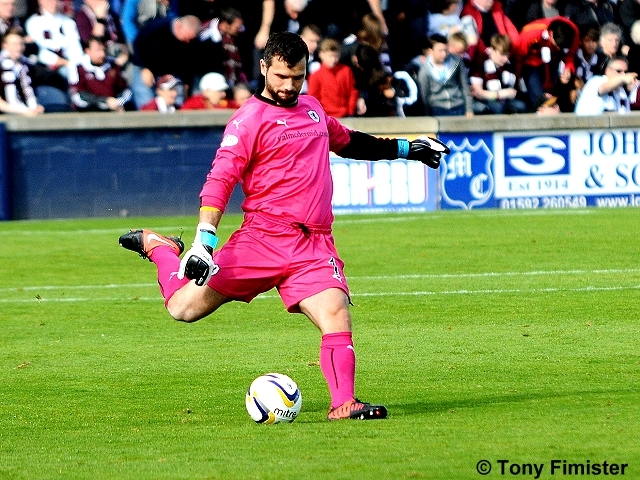 Rovers keeper Kevin Cuthbert was left exposed when the ball fell to Kevin McHattie lurking in the danger area, and although the full-back’s shot was blocked on the line by Rovers captain Jason Thomson, the rebound fell invitingly for James Keatings, who had the simplest of tasks in finding the unguarded net from six yards out. 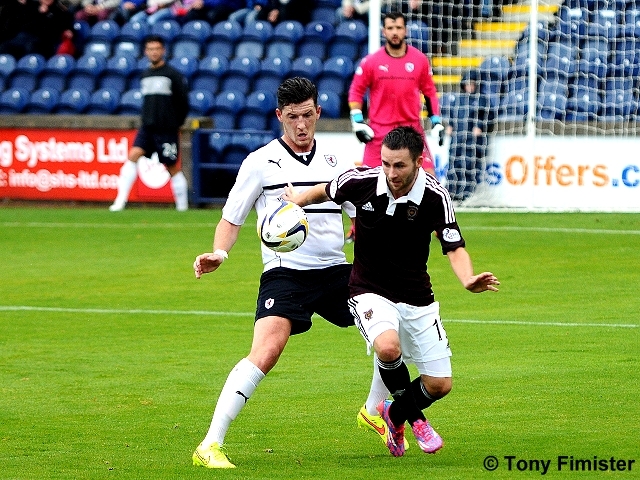 Raith Rovers 0 – 1 Hearts. Rovers tried to hit back immediately, and Grant Anderson took advantage of hesitant defending although his low drive from close range was well blocked by Hamilton. 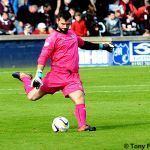 Shortly afterwards, Paul Watson tried his luck with a header but his effort lacked the pace to trouble the Hearts keeper. A sudden rainstorm then had the fans on the front rows of the stands scampering backwards for cover, as the pitch became heavy with water. 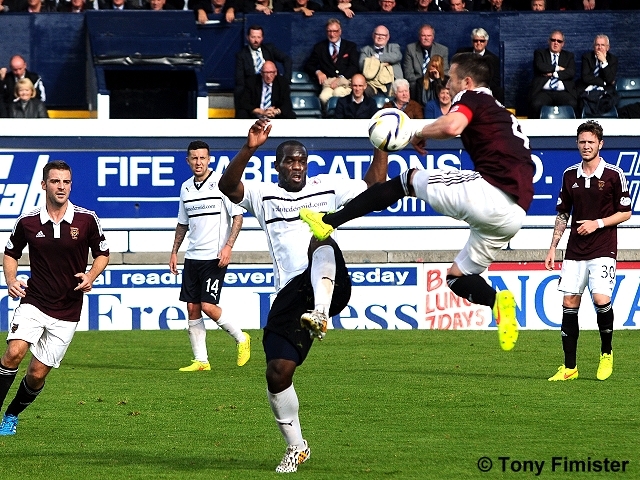 McHattie fizzed a low ball across the Rovers box, although there were no takers from those in maroon. Seconds later, Thomson and Nicolson, challenging a loose ball that in truth neither had any chance of catching, slid off the pitch entwined at a rate of knots that led to both players almost ending up among those home fans who had elected to remain at the front of the stand. 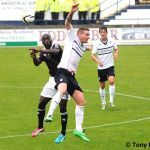 On the half hour mark, typically dogged play by Nade led to a Rovers corner, and Martin Scott’s header flashed over the bar. 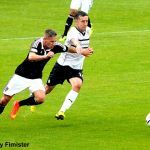 Shortly afterwards, under little pressure, Ross Perry conceded possession in midfield, allowing Hearts to drive with purpose at the Rovers rearguard. Cuthbert blocked a firm shot, although the ball fell invitingly at the feet of the lurking Keatings. 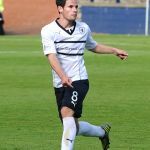 The forward showed commendable composure in slotting the ball beyond the Rovers keeper from twelve yards to double the Gorgie club’s lead. 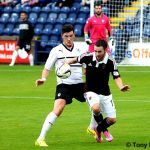 Raith Rovers 0 – 2 Hearts. Rovers, clearly frustrated at falling two goals behind, had Fox and Scott yellow carded in quick succession; although Scott could count himself particularly unfortunate for an innocuous-looking challenge close to the Hearts fans housed in the re-opened stand at the away end. 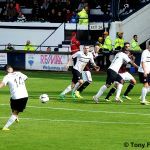 Despite forcing a series of corners in a bid to haul themselves back into the contest, Ryan Conroy’s flighted crosses never looked like threatening Hamilton’s goal, and Hearts continued to look more likely to score on the break as the opening period drew to a close. Hearts’ crisp passing had caused Rovers all sorts of problems, and as the teams left the field for the interval there was no disguising the fact that Rovers, if truth be told, may have counted themselves fortunate to be only two goals in arrears. Those Rovers fans hoping for better things in the second period would have been disappointed as the initial exchanges mirrored the first half, with Hearts looking the more accomplished and threatening side. That said, Jason Thomson’s look of disbelief at the caution brandished in his direction by referee Craig Charleston was understandable, given the Rovers captain appeared to cleanly win the ball in a tackle near the corner flag. 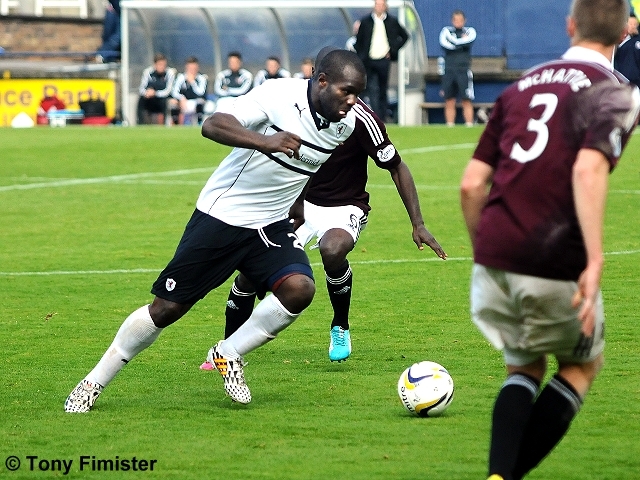 Shortly afterwards, Christian Nade pounced on a loose pass, but his dash towards the Hearts goalmouth was impeded by a crude challenge by Morgaro Gomis, who could count himself fortunate to receive only a yellow card for his indiscretion. 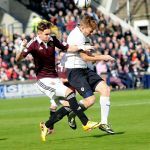 Prince Bauben was then substituted for Hearts on the hour mark, before Sam Nicholson’s mazy run deep into the Rovers half was ended by a foul by Perry. 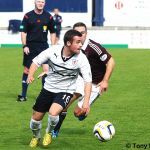 Any hope of a Rovers revival was then brought to a shuddering halt by the resultant free-kick, as Keatings’ shot from 25 yards sailed into the top corner of the net. It was a strike deserving of the acclaim afforded to the young striker for a hat-trick that had effectively put the game beyond the reach of the home side with fully thirty minutes remaining. 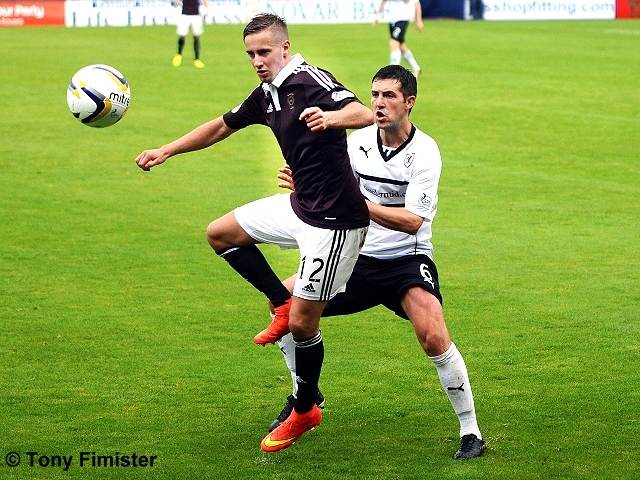 Raith Rovers 0 – 3 Hearts. Shortly afterwards, blue skies opened up over Stark’s Park once more, although few fans within the south stand sported a sunny disposition by this point. 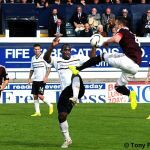 Indeed, such was the dominance being enjoyed by Hearts, their fans indulged themselves in a lusty chant of ‘There’s only one Christian Nade!’ by way of paying homage to their former player. 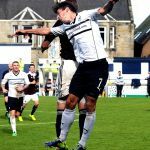 Rovers boss Grant Murray then replaced Mark Stewart with Kevin Moon, before Ryan Conroy stung the fingers of Hamilton with a dipping free-kick from just outside the 18-yard box. Gomes then made way for Gary Oliver, before Liam Fox was replaced with Lewis Vaughan. 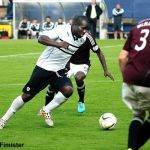 As the game entered its final stages, Christian Nade had a chance to score, but the big forward, struggling to bring the ball under control when in a good position to shoot, was crowded out by defenders and the chance was lost. 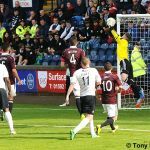 Hearts captain Danny Wilson was then cautioned for a foul on Nade – cue ironic cheers ringing down from the south stand – before Vaughan drew an acrobatic Hamilton save from his sweetly struck free-kick wide on the left hand side of the box. 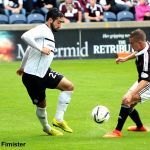 Keatings received a richly-deserved applause by the Tynecastle faithful when substituted towards the end of the game, as Rovers pushed for a consolation goal. Conroy’s cushioned header from a Nade cross almost obliged, although the ball drifted narrowly wide of the far post. 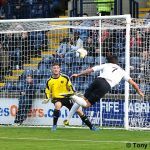 Anderson then tried his luck with a diving header from a floated Vaughan cross, but Hamilton blocked comfortably to deny the hosts. As the game entered injury time, it seemed fitting that the last word would go to the visitors. Gary Oliver picked up a loose ball inside the Rovers box, and rifled a low shot past Cuthbert’s despairing dive into the corner of the net. It was little more than they deserved. 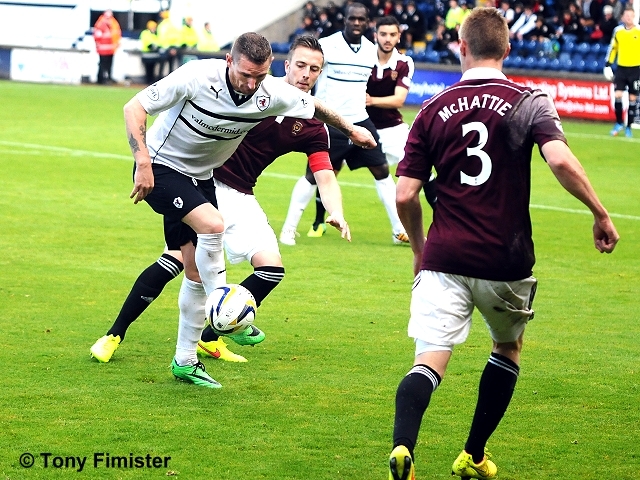 Raith Rovers 0 – 4 Hearts. At the final whistle, the Hearts players celebrated with the large travelling contingent, as those of a Raith Rovers persuasion prepared to lick their wounds following a testing, and ultimately fruitless, ninety minutes. Few among the 6105 crowd would, in truth, suggest that the final score line flattered Hearts, who were undoubtedly worthy winners. Of course, it remains to be seen whether Hearts continue this form throughout the campaign, but on this evidence they will not be far away from securing a rapid return to the SPL next spring. 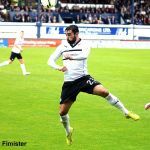 Rovers, on the other hand, will seek to regroup, although two difficult matches on their travels in the coming week at Dundee and Cowdenbeath will test their resolve to the limit. Some technical problems with the wifi, bear with us. The game has started briskly with exchanges of hearty tackles. Anderson injured but comes back on the park. Thomson snuffs out a run by Nicholson who was clear on goal. Nade heads into the hands of Hamilton. Nicholson rounds Perry who shoots, Cuthbert scooped the ball off the line into the path of Keatings who tapped in from 6 yards. Goal Hearts. 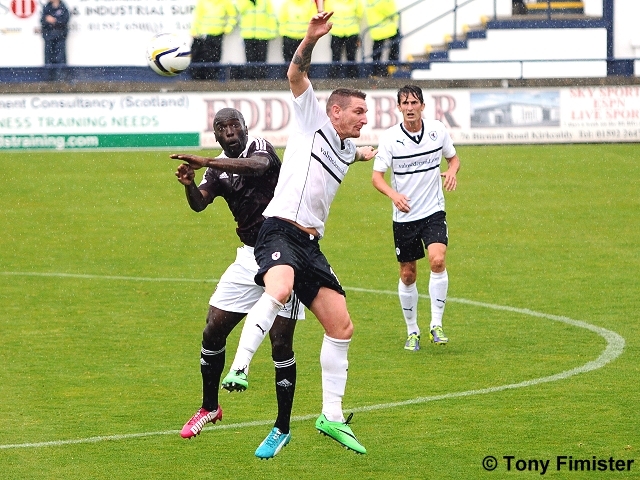 Paul Watson heads towards goal but Hamilton is well placed to save. 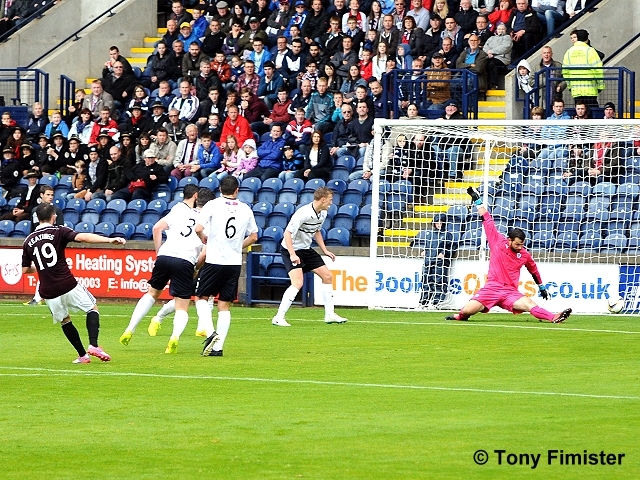 Holt coming close, the ball scudding past Cuthbert s right post. Thomson and Nicholson go sliding off the pitch and into the ad boards, both get up covered in glaur. McKeown off with a head injury. 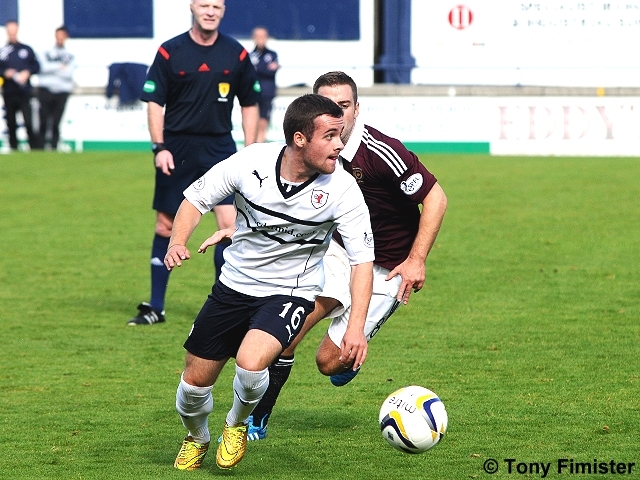 Conroy crosses from the corner, Scott goes wide with his header. 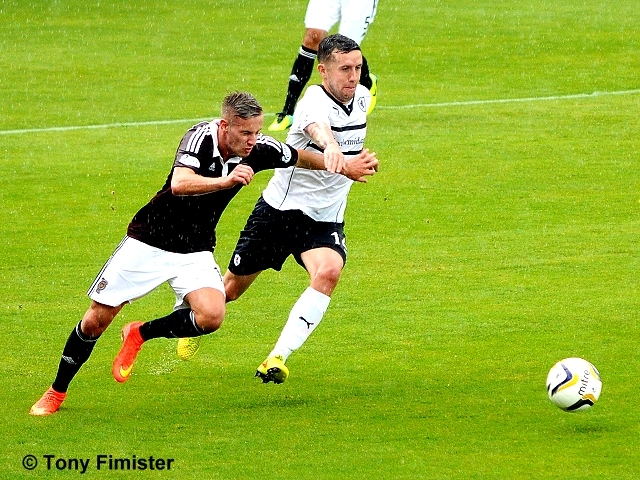 Bauben teased the defence, his shot rebounded to Keatings who slotted the ball past Cuthbert. Goal Hearts. Fox yellow for bringing down Nicholson. McKeown unleashed a long throw to Conroy who saw a defender block his shot on goal. By no means are Rovers giving up on this game, showing great spirit despite the deficit. King has a diagonal shot parried by Cuthbert, Nicholson skies the rebound. 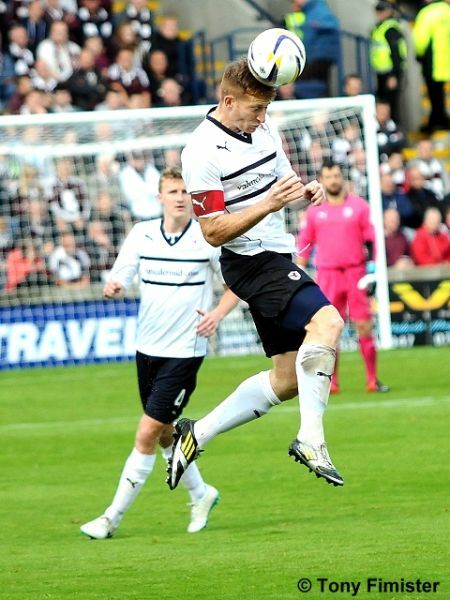 Scott from six yards grazes the outside of Hamilton s post with a header. A cross from Thomson lands on the roof of Hamilton s net. Bauben just getting to his feet and being assisted off the park. Thomson yellow for what seemed like a 50-50 with McHattie. Bauben recovered enough to launch Scott off the pitch with a robust challenge. Gomis yellow for bringing down Nade, it looked like he was the last man but the ref thought not. 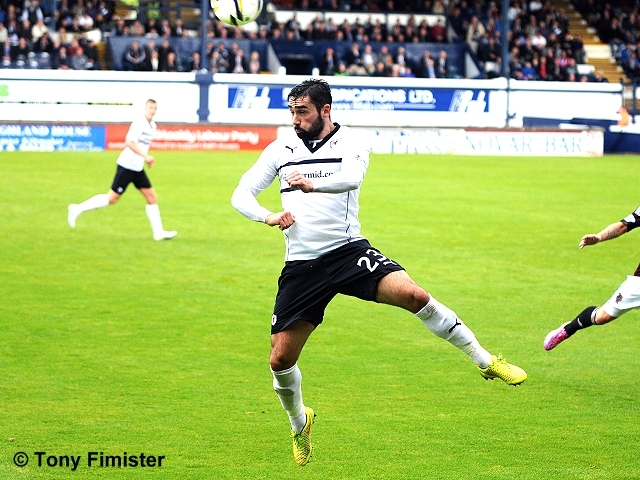 Direct from a free kick into the top right corner of Cuthbert s goal, Keatings completes his hat trick. Goal Hearts. Conroys free kick from 25 yards is tipped over by Hamilton from the corner Moon skied the ball into the South Stand. Gomis off, Oliver on. Fox off, Vaughan on. Nade with marvellous skills in the box is finally foiled by Ozturk. Lewis has been a livewire in his short time on the pitch. 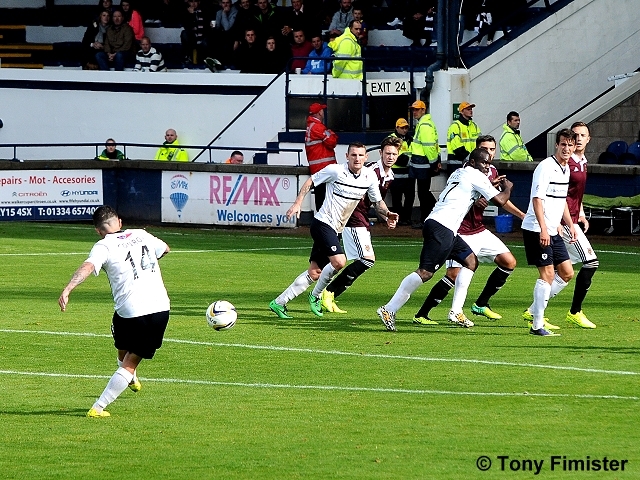 Vaughan shoots from the edges of the box forcing Hamilton to tip the ball over the bar. From the corner Nade heads across goal. Roy clean through, Cuthbert comes out of his area to clear the danger. Anderson crosses from the right, Hamilton has to dive low to his left to deny Scott. 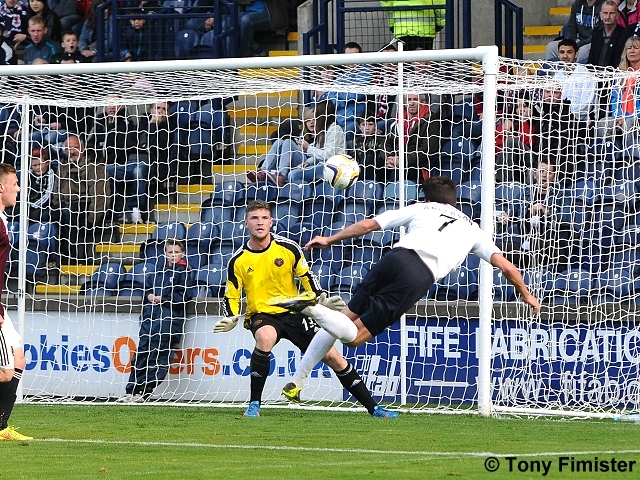 Conroy watched his looping header go just over the bar. Vaughan the provides a great cross to Anderson only to see the Eagle eyed Hamilton dive to intercept. Hamilton again, diving to save from Anderson s diving header. Oliver from just inside the box makes it four. Goal Hearts. 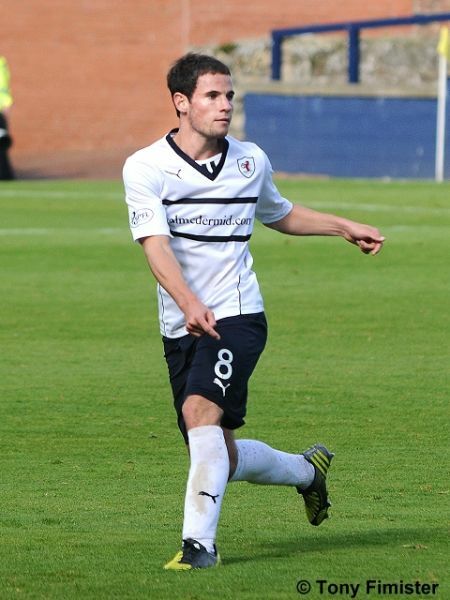 Raith: Cuthbert, Thomson, Perry, Watson, Fox, Anderson, Stewart, Scott, Conroy, McKeown, Nade. Subs: Moon, Callachan, Vaughan, Ellis, Matthews, Bates, Laidlaw. 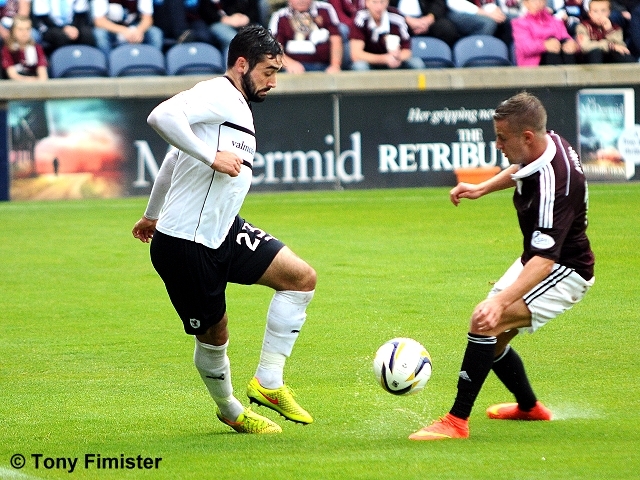 Hearts: Hamilton, McHattie, Wilson, Ozturk, Gomis, Holt, Nicholson, King, Bauban, Keatings, McGhee. Subs: Robinson, Smith, Oliver, McKay, Smith, Roy, Hollis.